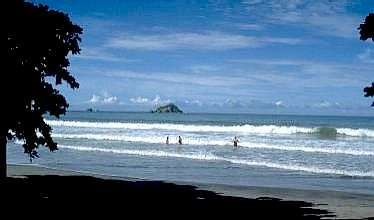 The town of Quepos on the Pacific Coast of Costa Rica, with its small airstrip, is the gateway to Manuel Antonio Beach and National Park. 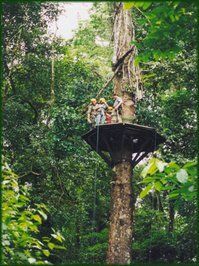 Within a relatively small corner of Costa Rica, travelers can find the excitement and adventure of a tropical forest, surrounded by one of the most beautiful natural environments, without sacrificing modern conveniences. There's magic to Manuel Antonio that is hard to explain. One thing, however, is absolutely certain: once you've been here you'll want to come back again. 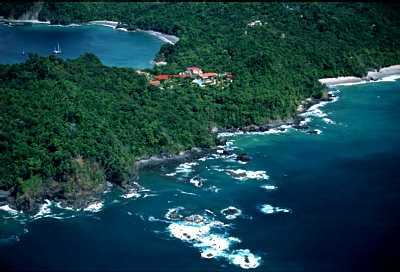 Manuel Antonio, with its 1700 acres of land mass and 135,906 acres of marine reserve, is the smallest of the 20 national parks Costa Rica has put aside for total protection. 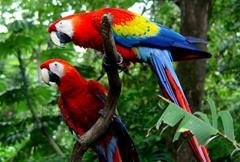 Even so, it is the country's second most visited conservation area (after Poas Volcano National Park). Conservation officials have fixed the park's carrying capacity at 600 people per day from Tuesdays to Fridays, and 800 on Saturdays, Sundays and holidays. On Mondays the park is closed to the public. The park, which is usually open from 7 AM to 4 PM, is closed as soon as the capacity is reached for that day. Located 100 miles south of San Jose on the Pacific Coast (a pleasant three-hour drive, or a short 20 minutes by plane), Manuel Antonio, which was declared a national park in 1972, is the natural habitat of species such as the endangered squirrel monkey (endemic to the area), white-faced capuchin monkey, raccoons, three and two-toed sloths, white-nosed coaties, brown pelicans, black-collared hawks and green kingfishers. They share the space with primary and secondary forests, bursting with cedars, bully trees, locust 'sur,' black locusts and silk cotton trees. 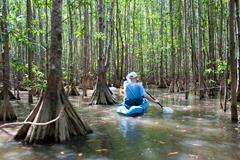 A mangrove swamp covers about 44.5 acres, adding to the biodiversity of the region. Three different species: red mangrove, buttonwood mangrove and white mangrove - abound. At the four star Casitas Eclipse Hotel you willl experience all the beauty of a true tropical paradise, nestled in the shadow of Manuel Antonio National Park on Costa Rica's Pacific Coast. Enjoy the hotel's premier location in one of the most scenic areas in the world, and the comfortable accommodations of its distinctive Mediterranean style villas. 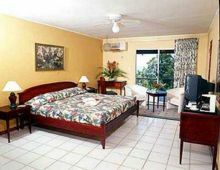 Each is spacious and personal, offering your choice of deluxe first floor suites or cozy second floor rooms. Located in Manuel Antonio, Villas Si Como No is surrounded by ten protected acres of lush tropical rainforest, inviting soft sand beaches, and nearby rafting rivers, making it a perfect romantic honeymoon hideaway. The hotel's 58 rooms are distributed within ten separate terraces. 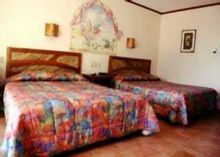 Every room offers jungle vistas, bathroom with shower, air-conditioning, stocked minibar, king or double beds, ceiling fan, telephone, and security safes. 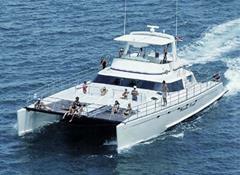 Also featured are Spa facilities, and a 46 seat private THX movie theater. 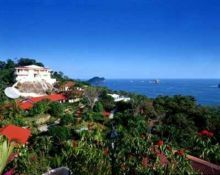 Enthroned atop a majestic bluff overlooking the Pacific Ocean and surrounded by lush tropical rainforest, El Parador Hotel is located in the most remote and pristine area of Manuel Antonio, yet within minutes from the Manuel Antonio National Park. Just ten minutes walking distance from the hotel is a hidden secluded bay where you will find the most breathtaking white sandy beach surrounded by tranquil turquoise waters and jungle. Needless to say, it makes the perfect honeymoon hideaway. Buena Vista Villas provides a unique combination of ocean front pleasure and a dreamy mountaintop with awe-inspiring vistas of breath-taking Pacific sunsets. All of this surrounded by a lush and intense green forest! The octagonal design of the bungalows was created so guests have a special view from every room. The view from the pool overlooks the Pacific Ocean and the coastline, and the pool's trickle down edge gives the illusion that the pool's water falls into the sea. 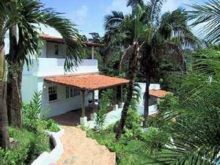 Arenas del Mar Beach & Nature Resort is a deluxe plus, extraordinary beachfront resort situated on the beaches of Manuel Antonio. This incomparable Costa Rican hotel was designed and built with a combination of deluxe accommodations coupled with the highest level of certified sustainability. Guest rooms, apartments and suites offer spectacular ocean views. Upscale dining is provided in the hotel's two restaurants, with a focus on fresh local products and personalized service. Other hotel facilities include a luxurious spa and a gift shop. Gaia Hotel & Reserve is an adults only, luxury boutique, 5-star beach hotel and resort. It is a member of 'Small Luxury Hotels of the World.' Imagine a tropical getaway that offers sublime luxury in a spectacularly exotic locale. This is Gaia. The Gaia Hotel achieves an ideal blend of modern amenities and natural scenery. 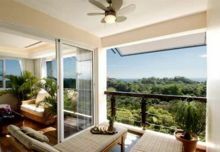 Nestled in the magnificent coastal forests of Costa Rica, the hotel's well-appointed, terraced suites and villas offer views of lush and pristine wild surroundings that are beyond compare. Plus seven more exciting Optional Tours not pictured! Download the PDF above for details. Notes: All tours require a minimum of two participants. Child rates apply to children 6-10 years old. Many tours do not permit children under 6.